This site acts as an online companion for a PhD thesis that I’m currently undertaking at the University of Glasgow, which focuses on the Glasgow Apollo. 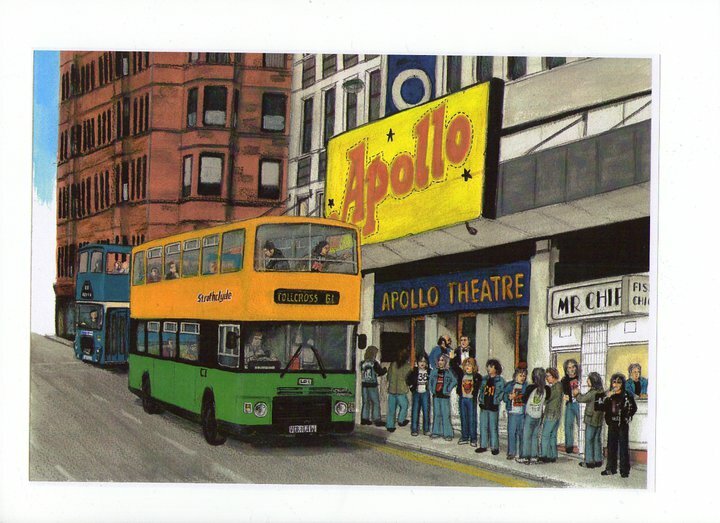 Regarded as a key live music venue during the period 1973-85, the Apollo has since generated a wealth of publications, productions and media coverage, including books, radio, TV and DVD documentaries, as well as a stage musical. Memories of the Apollo experience abound from artists and audience alike, and serve to provide the main source of this coverage. Why am I undertaking this research? I think the reason why we’re still talking about a music venue that closed some twenty-seven years ago deserves some sort of analysis, and much of my research will centre on some of the factors that helped to shape the Apollo experience and will also reflect on why it is still considered to be such a significant venue by some observers. As Glasgow currently possesses a distinctly positive reputation as a city of live music, it may well be that the Apollo acts as a ‘reputation initiator’ for this status, and, again, this deserves some consideration. Among numerous other aspects, the study will also look at the lineage of live entertainment in Glasgow (such as ballroom dancing and variety theatre) before the Apollo opened, as well as the live music scene in the city on either side of the Apollo era. Overall, the research aims to provide a fuller understanding of why Glasgow is so highly regarded as a city of live music, and this where you could perhaps make a valuable contribution. I’m keen to find out about your Apollo experiences. I’m particularly interested in finding out if you went to a pop, soul or jazz concert at the Apollo. What bands did you see there? What was the best gig (or worst gig) you went to and why? Did you have any encounters with the artists who performed there, or with the venue’s bouncers for that matter? What about the (lack of) facilities? What made the venue ‘special’ or, for that matter, underwhelming and unimpressive? How did you ensure that you got to see your favourite band if the concert had sold out? Did you notice any difference between the first phase of the venue (1973-78) and the second (1978-85)? What do you miss most about the venue? Were you heartbroken when it ceased to exist or were you glad to see it closed? Depending on your response I would hope that some of these questions, and more, will be explored in the weeks and months to come through discussion threads on the website. I hope you’ll share your Apollo experiences on the site – this would be of huge benefit to the study and would be greatly appreciated. I’ll also keep you up to date on my research activities and let you know some of the interesting facts that I’ll no doubt uncover about the venue. As the site is in the process of being constructed please excuse the current lack of content and facilities – this will be addressed within the next few months. In the meantime, if you have any memories about the venue that you would like to share or would just like to provide any general comments, then please email at k.forbes.1@research.gla.ac.uk , I would be delighted to hear from you.